The crack of the AK47, as the cavalry centers to the rescue. April 12, doomsday, Krahn versus the country. Like Jesse and Frank James of the American Wild West; so were they, "the new Liberian outlaws." The fire next to time created a "Master Sergeant" and his entourage. These men weren't robbing banks like Jesse and Frank; they robbed lives. There were shootouts on the beach, in the streets, in towns, and small villages in Liberia. Many murdered in cold blood, while the others fled. The upheaval was of no merit. 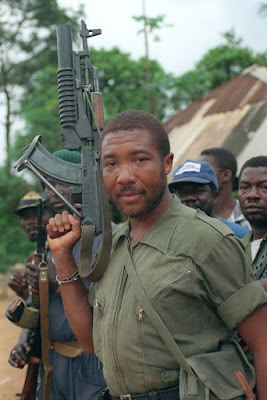 A specter haunted Liberia– the phantom of Totalitarianism after the idea of "Elitism" that was pulverized by the barrels. It took insubordination and an alliance to exorcise this specter: Quiwonkpa, Brigadier general Johnson, and Ghankay, Liberia's Radicals, and U.S.-spies. The question at the time was, "what would have become of powers, after elitism?" What would have become of the new system that heaved back the branding reproach of "ELITISM," to practice "totalitarianism," as well as against its ultraconservative adversaries? What would have become of those who fled and seek refuge in distant lands? I. Totalitarianism was already acknowledged by all African states to be itself a power. II. It was impossible that a totalitarian of any African country, especially in Liberia, at that time would openly, in the face of the entire world, resist the ideas, their tendencies, to control, imposed genocide, military justice and remain a power. III. Some of those who fled for refuge became the exorcists. by any barbarous means necessary. This brutal centers wrecked havoc in the city of Freetown. Limps was lost. There were severe and grotesque human rights violations breaking souls. Some of those who fled for refuge became the voices to an end of the madness. But the madness did not stop there but became more primitive in lives. Small boys and girls, who should have held a pen and paper, carried an AK47. The idea of child soldiers became the front of the state. To this end, to answer those questions, "what became of those powers?," urged the sketched of Western imposed-democracy. With this democracy, came a leader from the struggles, who became a Queen and a so-called "IRON LADY" to the West. Illiberal democracy replaced totalitarianism. Some of those who sought refuge in distant lands went back home to participate in this new rising, perhaps another delusion. Those who became comfortable and naturalized, in distant lands were looked at as obsolescence. They were denied "rights" due to circumstances that they could not control. Some of the refugees, who fled, and returned, became the symbol of a new country. Some returned to impose the same system that they feared under past specters. On the other end, the reactionary adversaries, the CDC, crushed the practitioners of "illiberal democracy" and promised "HOPE FOR CHANGE." Would this hope be in the benefits of the masses or alter the country in reversal, or put it on the path to success? Now, you are doing well to have lot contributors on your blog but I think Henry Johnson use the wrong pic maybe to be attractive to his followers like me. I might need glasses to read his work on your blog. If he continue with the path of his first nation address about the Non-Negroes citizenship it might go somewhere wrong at this time. Too soon for that.